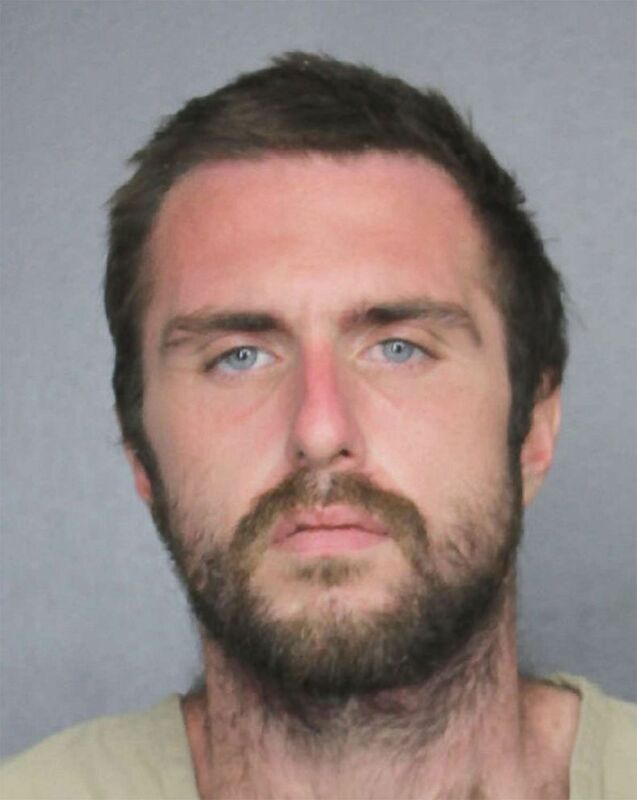 Daniel James Dunkelberger is pictured in a booking photo released by the Hallandale Beach Police Department. Two police officers in South Florida have been placed on administrative leave while their department investigates a video that purportedly shows them beating a suspect on the ground with batons. Officers Jaime Cerna and Richard Allen of the Hallandale Beach Police Department arrested Daniel James Dunkelberger, 27, on Wednesday afternoon after he allegedly stole a cellphone and the charging cable from someone's parked vehicle. According to the probable cause affidavit, Dunkelberger "tensed his body to impede" the officers from arresting him. The officers pushed him to the ground where he continued to resist. Cerna deployed his Taser stun-gun, "which was ineffective." Dunkelberger stood up and attempted to flee from the officers, so Cerna deployed his Taser again. But Dunkelberger still "refused to comply with commands," according to the affidavit. Cerna had already used both Taser cartridges, so he took out his "expandable baton" and struck Dunkelberger "several" times on his legs. Dunkelberger then went down to the ground and officers were able to restrain him with handcuffs, according to the affidavit. Dunkelberger was taken into custody on charges of burglary and resisting an officer without violence. A day later, a video emerged on social media from someone who claimed to have witnessed the encounter between Dunkelberger and police in Hallendale Beach, some 13 miles south of Fort Lauderdale. The footage appears to differ from the officers' account. The minute-long video shows two officers with batons repeatedly beating a man standing next to their marked squad car as they order him to "get on the ground." One officer is holding what appears to be a deployed stun-gun in his left hand, with its metal strings attached to the suspect. The other officer pulls the man to the ground, who seems to be wailing in agony. "Now you're going to get on the ground," one of the officers says. "Doesn't that hurt? The officer holding the stun-gun strikes the man while he's lying on the ground screaming. The witness recording the video yells, "Stop hitting him!" The officers repeatedly yell at the man on the ground to "turn around" before pulling his leg to flip him over onto his back and cuffing his hands. The video has been viewed more than 11,000 times on Twitter. The Hallandale Beach Police Department subsequently released a statement Thursday, saying it was "aware of the video" and it is conducting a "thorough and objective internal affairs investigation." The department said it is also seeking to obtain all surveillance footage from the area during the time of the incident. Police later said Dunkelberger was transported to a nearby hospital after being arrested and then taken to the Broward County Sheriff's Office. Hallandale Beach city manager Roger Carlton called the video concerning during a press conference Thursday. "There is video of two of our officers in an altercation with someone," Carlton told reporters. "It is of serious concern to the police department, to me as city manager and certainly to our elected officials." "Any video of an altercation between a citizen and a police is always a concern. As you know, at a national level, there is more and more consciousness of this, more and more concern about it," he continued. "Hallandale Beach is a good place, we're a family place. But like any city, we have crime and want our people to be protected. But we also want everybody treated fairly, so I think it would be grossly inappropriate for any member of the leadership of this community not to be concerned." The two officers have been placed on administrative leave amid the ongoing investigation into the incident. One of the officers is on paid leave, while the other is not because he recently returned from retirement and is paid hourly, according to Carlton. Hallendale Beach Police Deputy Chief Michel Michel told reporters at the press conference that the officers were not wearing body cameras at the time of the incident, nor was there a dashboard camera in their patrol car. The city recently approved the acquisition of body cameras for sworn officers, and the installation of this equipment is still underway, according to Carlton. Carlton cautioned that the the witness video only shows "a point in time," which is why they're hoping surveillance footage and other video can fill in the gaps. He urged members of the community who have any information about what happened or additional video to come forward. Carlton said he doesn't believe the video is evidence to "any pattern" within the city's police force, and that law enforcement officers maintain certain rights and privileges under Florida law. "We are concerned, I want to be very candid about that," he added. "Whatever's necessary not only to resolve this case in a fair and appropriate manner but to ensure that all of our officers are well-trained in how to decompress situations will be done."